Nov 13, 2018 | Why Washington? After an exhaustive nationwide search, Amazon announced that it would divide some of its future operations between New York City and Arlington, Virginia, creating HQ2a and 2b instead of the much-anticipated HQ2. Each location will eventually employ 25,000 Amazonians and command about four million square feet of office space. Amazon will invest about $5 billion in the two campuses. The home of HQ1 – Washington State – welcomes you to the club. The four million square feet of space is about equal to Amazon’s planned future expansion in the greater Seattle area. The company currently occupies approximately 10 million square feet of space in the metropolitan area and announced plans to lease, rent or build another four million square feet over the next few years. That would be equivalent to three additional skyscrapers in the area’s skyline. 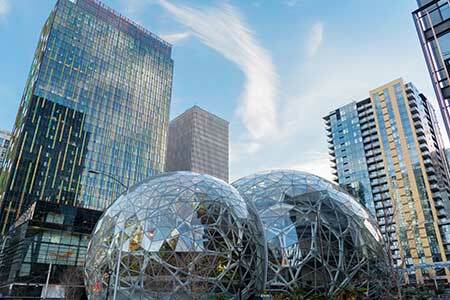 Amazon has been scooping up real estate at a hectic pace to keep up with record growth. Amazon has 40,000 employees in Seattle proper and the company has 8,238 news openings listed on its website at the moment. The company chose two locations instead of one to access more talent. No single site seems in the U.S. appears to be able to match Seattle’s remarkable wealth of top-tier technology workers, nor its culture of bold and often brash creativity. Some media reports put the taxpayer incentives, investments and offsets used to attract the company at about $2.344 billion. Avis, the perennial runner-up to Hertz in the car rental business used the slogan “When you’re only No. 2, you try harder” for almost 50 years, until 2012. We just wanted to let Virginia and New York know it’s available again.